Beautifully styled living area featuring cathedral ceiling and views onto the pool. For your comfort a sleeper sofa, a twin sofa and a 40" LCD TV with cable channels. The dining room adjoins this area and has seating for six. The master bedroom has a king sized bed, dressing table, LCD TV with cable channels, bedside drawers, hairdryer, walk-in wardrobe and en-suite shower room with his 'n' hers washbasins. The villa has two further bedrooms, one has a queen sized bed and a TV and the other has twin beds. Sunshinevillasflorida are situated in a very convenient location at Indian Wells, 1.5 minute drive from large Walmart (not to be confused with Walmart on 192 as this is just off 535) and is also walking distance to the 192, not only this but boasts being nearer to Disney attractions and Sea world than most other villas. The villa which is fully equipped is spacious and attractively furnished throughout. The comfortable lounge area has a vaulted ceiling and views onto the pool. All patio doors that lead to the pool are alarmed for safety so that small children cannot wander into the pool area without setting the alarm off, the pool area itself is fully screened and the rear garden is fenced, perfect for families. Our sunshinevillasflorida villas are professionally managed with a friendly and helpful team to make your stay a holiday of a lifetime. There are several golf courses within a short drive from the villa. Notes on accommodation: The villas are fully air-conditioned. There is also at the villa a washing machine, dryer, iron and ironing board. A cot and highchair are available at no extra cost. For complete security and peace of mind the villas are equipped with a simple-to-operate alarm system, door peephole and window locks. Outside: The gardens are of a good size and laid to lawn. Unlike many Florida properties ours have fully fenced back gardens. The swimming pool, which is screened for added privacy and protection is approximately 30' x 15'. There is also 'in pool' lighting should you fancy a late-night dip. The swimming pool is maintained to a very high standard and serviced weekly. Sun loungers, chairs and a patio table are also by the pool area for your enjoyment and comfort. Pool heating is available during the cooler months at an additional charge. My family enjoyed our stay. There were a few issues that I addressed with the owner who promptly got back to me about. My boys loved swimming in the pool and it was a short drive to the Disney parks. Close to Walmart and other dining and shopping options. Great location in terms of access to the parks - all within 15-20 minutes of the property - and easy driving. Also, very good supermarket just around the corner and lots of places to eat within a 5 minute drive. Very comfortable throughout - particularly comfortable beds. All the facilities you'd ideally want in the property including a well-equipped kitchen, wifi and washing/drying. Oh, and not forgetting the pool which was a good size - not just a 'plunge pool', extremely clean and a very comfortable temperature. Helpful and responsive service company in the US to support you if any needs arise whilst you are there. We had a minor issue with the wifi and they were onto it straight away and all over it until it was fixed. The villa was easy to find and had a lovely open plan layout. It was well equipped with everything you could need (other than a BBQ). The garage had a washer and dryer which was so handy to keep on top of laundry. The garden and pool were private and fenced off, and the pool was a good size, which is great when you have kids. The villa is in a great location, quiet and private, with a Walmart and shopping outlet nearby, although you would need to hire a car, as most amenities were not walking distance. It is only a short drive to the Disney parks. All in all, we had a wonderful holiday. This is a large family home which was more than big enough for a family of 5 (3 adult children). The bedrooms were spacious and with plenty of drawer and wardrobe space. The master bedroom is very large with ensuite and walk in closet. The living areas, again very spacious and comfortably furnished. The kitchen was well equipped and had everything we needed. The home was spotlessly clean with plenty of towels and linen. Thanks for your lovely comments, yes it does seem to tick all the boxes. We have a new management team assisting now and are very pleased with this adjustment. We too love the things close by that you have mentioned; Smokey Bones however we have not but now will try on our next visit, Cheers! Our family had a very comfortable stay in Bear Path. The accommodation is clean and spacious. The pool is a lovely size and the grassy garden area is a huge bonus for families with young children. The owner was very generous with his time on the telephone and online dealing with my queries prior to our visit. Would definitely recommend this villa to friends. Thank you for you kind comments, we do try to assist in any way we can to try to make your stay as perfect as possible. Indian Wells did well for us !! The property is in a great location for theme park visits and shopping, and the addition of the site tennis courts was brilliant. The villa was situated in a nice quiet road and the pool was great to sit by and relax, as well as being private and not overlooked. The villa itself was comfortable, clean and a great place to come back to after a long hot day out. The Management Company were very good and ensured that our stay went well. It is extremely good value, and will be considered again for future trips. Thank you for your review and highlighting the peacefulness and privacy of the villa position. As well as the excellent location this too was one of the attractions when we decided to purchase. Yes our management company do an excellent job and are very attentive, I was pleased that it was noted. 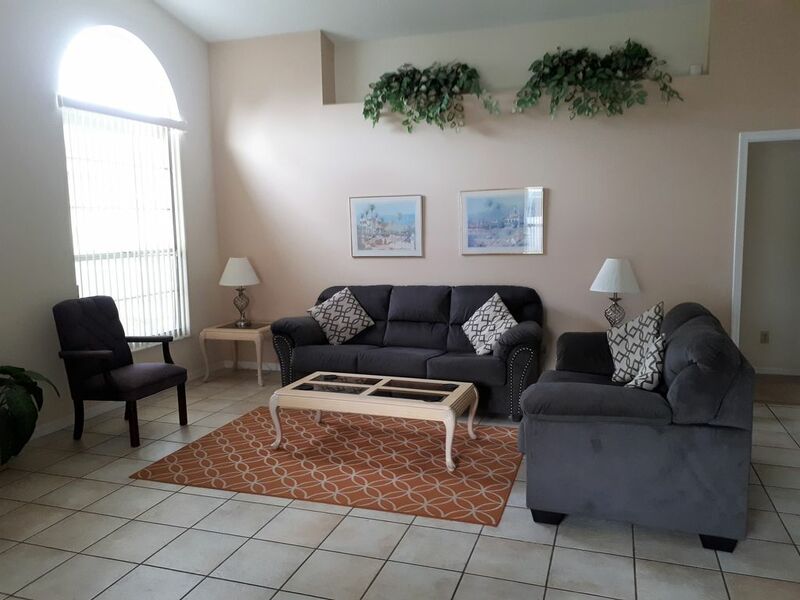 The villa is situated within a very short drive to both the Interstate 4 or the 528 making the journey travelling to either Clearwater/Tampa or Cape Canaveral/Cocoa Beach an easy option. The villa is approximately a 30 minute drive from Orlando International Airport or about an hour's drive from Sanford Airport. 1.5 minutes from Walmart Superstore. 2 minutes from restaurants/entertainment on the 192. 3 minutes from top brands factory outlet mall on 535. 4 minutes from fun miniature golf. 5 minutes from Disney Village/Marketplace. 5 minutes from Old Town. 5 minutes from large Flea Market. 8 minutes from Epcot. 8 minutes from Disney water parks. 10 minutes from other Disney attractions. At Indian Wells you also have the use and facilities of a larger Communal pool and further sunbeds to relax on. There is also a lake and park area to stroll or jog by. If tennis is your game then the court is waiting for you, as is also a basket ball area and net. For the young ones there is a play park area with swings, climbing, etc. Lastly in the grassed area a barbecue area has been set up, just bring your coals and steak. Booking Notes: A reservation deposit of £150 (USD $300)is payable at the time of booking. The balance, inclusive of a refundable security deposit is payable 8 weeks prior to your intended date of arrival. For bookings made 8 weeks or less before date of arrival, the full amount must be paid at the time of booking. Changeover Day: Arrival and departure days are flexible.